I seem to be making a habit out of apologizing for my tardiness! But please blame IE. I am no longer able to open WordPress on Internet Explorer. AAArrrghhh! HATE Chrome cause of all those pop-ups, but am now back on it. If any of you have any advice on how to get Wordpress functioning on IE please do let me know. But remember I am a non-techie who slips into a coma when faced with words and phrases like ftp and plugins. So do be kind and gentle when dishing out the advice. Waking up in the tent to utter silence was one of the strangest experiences of my life. 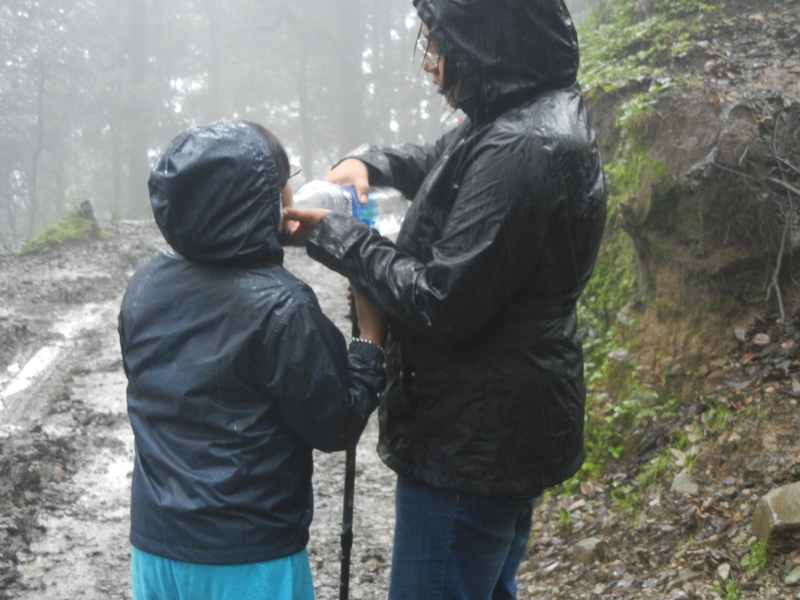 I think I had half expected to be washed off the mountainside by the rains. But here we were. Safe and sound. The adorable mouse had departed for its home and all the chattering and buzzing bugs had cloaked themselves in the anonymity of day light. Opening the flap of the tent I nearly tripped over Yugi who had also decided that it was time to wake up these lazy adults. This was followed by a run to the two port-a-loos closest to us – everyone wanted to get there first. Not surprisingly the girls won the race on the strength of their whining power alone. All of us had a quick cup of tea and an aloo paratha each. We were scared to have more than that as we had a drive of 4 to 5 hours to look forward to. Packing our bags (a matter of minutes) we said our byes to Thakur who promised us that the next time he will definitely organize the chicken for dinner. Sakshi looked at him like he was off his head. She wouldn’t return to Jalori for all the chicken curries in the world and anyone who knows Sakshi knows that she LOVES chicken… in any form. We then had to walk / climb / scramble up to the point where the XYLO was. 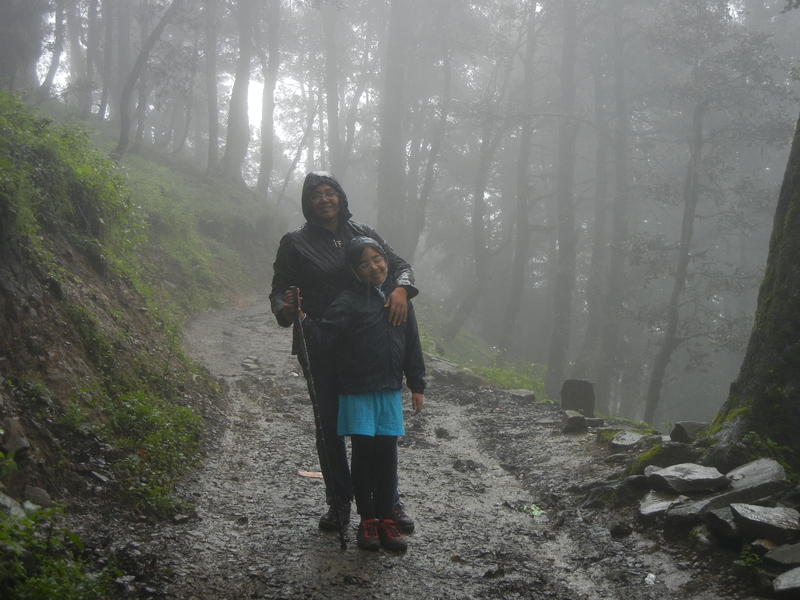 Surya walked with Sakshi as she and I struggled for air as we climbed up. Reaching up, it was decided that the bags will be loaded in to the car and Surya will take the car and drive out to a safer part of the road and the rest of us will walk the half kilometer or so to that point. This will keep the weight off the car and allow Surya to maneuver the car safely. Walking the 500 meters was alright. In between we had a few cows deciding that they wanted to walk in the middle of the road and we sidled along the side. Thakur and Surya had warned us to keep taking small sips of water as we walked because at these heights you don’t really feel thirsty and can become dehydrated despite the cold. Walking those 500 meters we realized that the decision to scrap our original plan for the morning had been good cause the paths were so slushy and walking in the rain with three little kids was no joke. 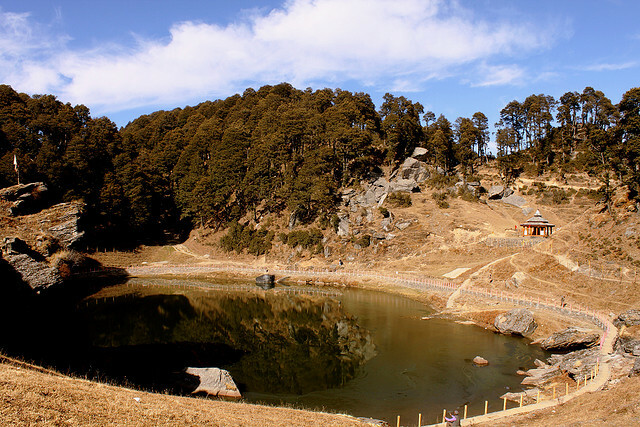 The original plan had been to trek across to Sirolsar Lake (4km or so from Jalori Pass), which according to Thakur was about an hour’s easy trek away through forests of oak, blue pine, fir, Deodar and spruce. 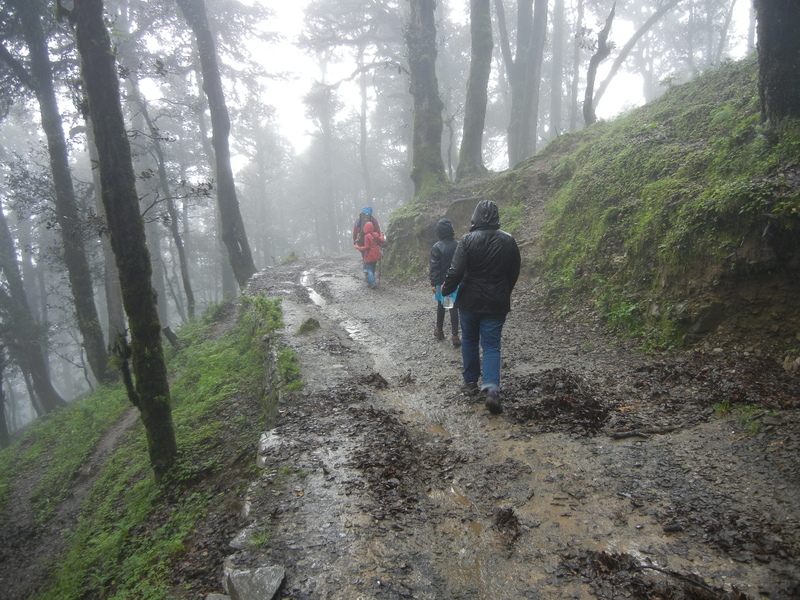 But the previous night’s rain had resulted in a heavy mist which Thakur predicted would not clear for the next few hours, which meant that we would not be able to see the lake even if we stepped in to it. There is a lovely story about the lake. According to local legend, you will never find any fallen leaves floating on the lake’s surface. The locals state that birds fly down and pick the leaves off the surface ensuring that the lake is always clean. Since we scrapped our Sirolsar plan I cannot say for sure if the lake surface was as clean as my mom-in-law’s kitchen or not. If any of you have had the opportunity to visit Sirolsar Lake do let me know about your experience and if the lake was indeed leaf-free. Tired troopers – cold, wet and suffering from altitude sickness. But it was still an experience worth having. 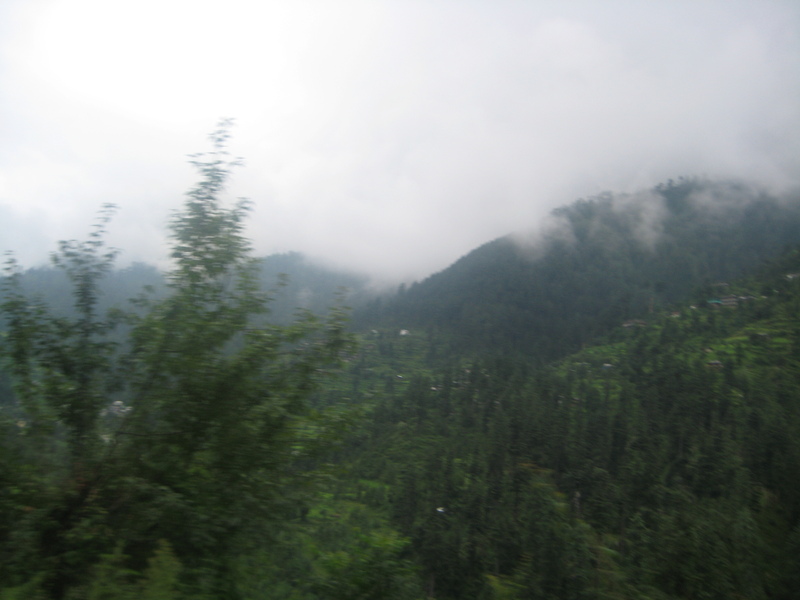 Anyways, left with no choice we decided to head out of Jalori and move on to our next stop – Manali. 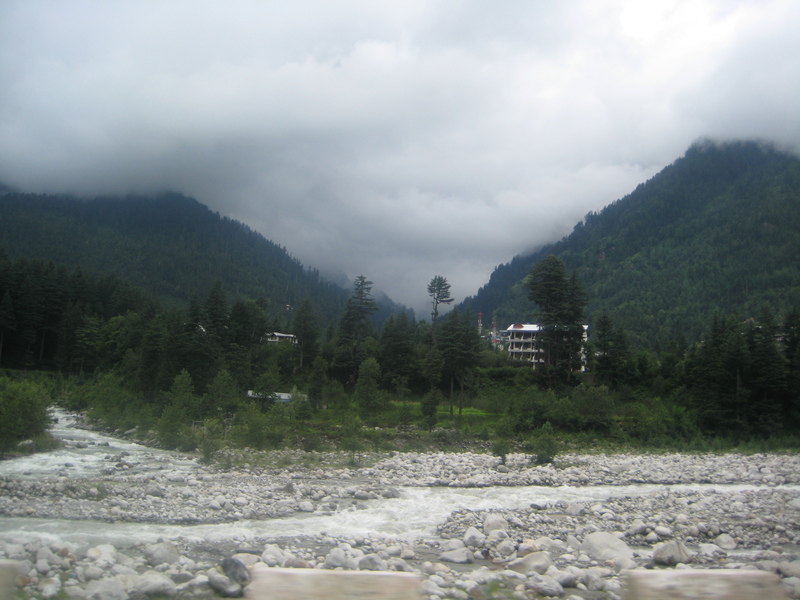 Beautiful Manali with the tempestuous River Beas. But before we could pay our respects to Beas, we had to greet River Thirtan. More about her in the next post.